Eduardo Jiménez does not have any MLB stats for the season. Resides in Araya, VZ during the offseason...Recommended/signed by Alejandro Rodriguez and Pedro Chavez for the Tigers. Spent the entire 2018 season with Single A Lakeland, making a career-high 40 appearances...Named to the Florida State League Midseason All-Star Team...Ranked second in the Florida State League with 15 saves and 34 games finished...Appeared in seven games during the month of April, compiling a 0-1 record with four saves, a 0.84 ERA (10.2IP/1ER) and 13 strikeouts...Pitched in eight games with the Mesa Solar Sox in the Arizona Fall League and had a 1-0 record with a 1.32 ERA (13.2IP/2ER) and 12 strikeouts. Combined to pitch in 34 games between Single A West Michigan and Single A Lakeland in 2017...Made seven appearances with Single A West Michigan in April, posting a 0-1 record with one save, a 0.73 ERA (12.1IP/1ER) and 17 strikeouts...Placed on the suspended list from May 29-June 29...Did not allow a run over his final eight appearances with the Whitecaps from June 30-July 19, a stretch of 10.1 innings.. .Posted a 0-1 record with five saves, a 2.70 ERA (10.0IP/3ER) and 11 strikeouts in nine outings with Single A Lakeland in August. 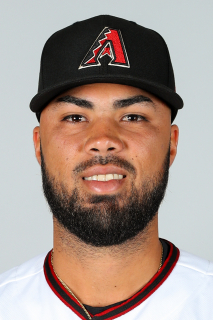 April 11, 2019 RHP Eduardo Jimenez assigned to Toledo Mud Hens from Erie SeaWolves. March 5, 2019 Detroit Tigers optioned RHP Eduardo Jimenez to Erie SeaWolves. October 1, 2018 Detroit Tigers recalled RHP Eduardo Jimenez from Lakeland Flying Tigers. March 13, 2018 Detroit Tigers optioned RHP Eduardo Jimenez to Lakeland Flying Tigers. November 20, 2017 Detroit Tigers selected the contract of Eduardo Jimenez from Lakeland Flying Tigers. July 22, 2017 RHP Eduardo Jimenez assigned to Lakeland Flying Tigers from West Michigan Whitecaps. June 29, 2017 West Michigan Whitecaps activated RHP Eduardo Jimenez. May 29, 2017 RHP Eduardo Jimenez roster status changed by West Michigan Whitecaps. April 1, 2017 RHP Eduardo Jimenez assigned to West Michigan Whitecaps from Connecticut Tigers. June 16, 2016 RHP Eduardo Jimenez assigned to Connecticut Tigers from GCL Tigers East. August 21, 2015 GCL Tigers activated RHP Eduardo Jimenez from the 60-day disabled list. June 21, 2015 GCL Tigers placed RHP Eduardo Jimenez on the 60-day disabled list. September 5, 2014 GCL Tigers activated RHP Eduardo Jimenez from the 60-day disabled list. June 19, 2014 GCL Tigers placed RHP Eduardo Jimenez on the 60-day disabled list. May 1, 2014 RHP Eduardo Jimenez assigned to GCL Tigers from VSL Tigers. May 11, 2012 RHP Eduardo Jimenez assigned to VSL Tigers. July 11, 2011 Detroit Tigers signed free agent RHP Eduardo Jimenez to a minor league contract.